Push Notifications, a.k.a. webhooks, allow you to set up integrations that correspond with ‘notifications’ from Currencycloud. There is a set of events described below that can trigger push notifications on the Currencycloud Platform. When one of these events is triggered, we send an HTTP POST command to the webhook’s URL. This allows you to track transactions and state changes in a more efficient manner and automate communications internally or with your customers. When you are ready to get set up with push notifications, please contact your Solutions Manager. The following entities and events generate push notifications on the Currencycloud platform. These events can be configured individually to generate a push notification. 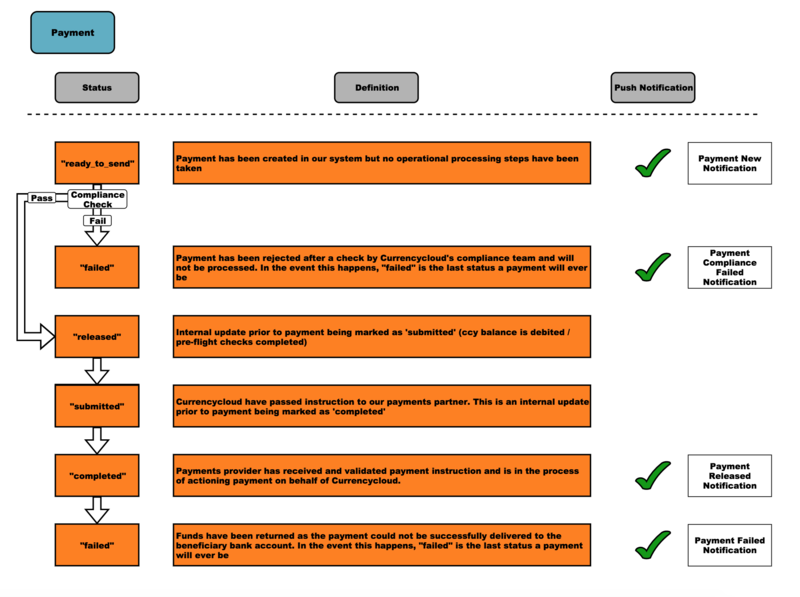 The following diagram presents the different status payments go through during their lifecycle on the platform. This also highlights which statuses trigger push notifications. Below are some examples of the push notifications described in the diagram above. The following diagram presents the different statuses that a conversion goes through during its lifecycle on the platform. The diagram describes also which statuses trigger events that are covered by push notifications. The following diagram presents the different statuses that a transfer goes through during its lifecycle on the platform. The diagram describes also which statuses trigger events that are covered by push notifications. "reason":"moving funds 2 -> 3"
The following diagram presents the details of a funding transaction.